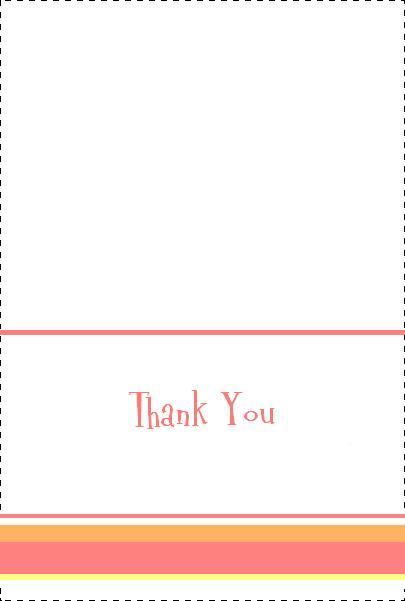 Here one of many free printable baby shower thank you notes. The card below can be used for baby GIRLS, BOYS, or TWINS. These thank you cards are the perfect way for the expectant mother to tell her guests how much she appreciates their love and support. Using the instructions below, I recommend that you print these baby shower thank you notes on a heavy paper or white card stock. That will give your thank you notes a classy and quality look. After you print one of these baby shower thank you notes out for each guest, cut along the dotted lines, so none of the lines show and then fold it in half. (Note: The line above the "Thank You" is NOT the center line to fold on - just fold the invitation exactly in half by matching up the corners) Then write a short thank you note on the inside! Click here for more baby shower thank you notes !